In the days following Donald Trump’s inauguration, a whirlwind of executive orders have prompted Angelenos to flood LAX and the streets of downtown. Continued protest is one of the most important ways Angelenos can stay active in fighting for the best version of America, but it’s far from the only action you can take. The success of the global Women’s March movement has sparked the creation of similar protests. While world-wide events like the Trump Tax Returns March (April 15) and People’s Climate March (April 29) are already scheduled months in advance, splinter protests like the ones at LAX this past weekend will continue to pop up. Others, like the March for Science, are still working out a schedule. 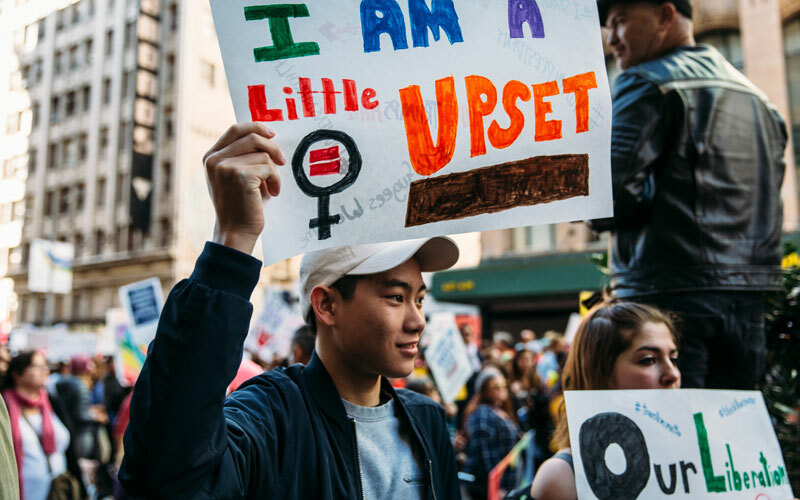 Searching the news and social media with keywords like “protest” and “march” is a great way to stay informed and find demonstrations happening near you. 2. Learn how to be a better protester. Activism is hard work. Training makes it easier. Sign up here to attend a free training session hosted by the Los Angeles mayor’s office. Or, pick up a copy of the Midwest Academy’s manual “Organizing for Social Change,” a guide for organizing touted by progressives like Congresswoman Jan Schakowsky. 3. Take ten actions in 100 days. Join the organizers of the Women’s March on Washington in marking the first 100 days of Donald Trump’s presidency with ten concrete actions. First up? Mailing your senator a postcard that explains the issues that matter most to you. Each collective action can be accomplished over a period of ten days, making this campaign one of the easiest ways to commit to long-term action. Despite what Trump would have you believe, the election sparked a wave of support from readers that has made the press strong. Subscribing and donating to local and national news outlets funds the stringent investigation and analysis that holds politicians accountable. 5. Curate what you read. Social media isn’t just reserved for arguing with strangers in the comments below your friend’s post about the immigrant ban—it can be a powerful tool for staying inspired and informed. Make Twitter your go-to source for breaking political commentary by following journalists like David Fahrenthold and Lauren Duca, and take the time to upgrade your inbox as well. Civil rights activist Michael Skolnik’s newsletter is a useful weekly roundup of new ways to take action. 6. Share your ideas with the Obama Foundation. Do you miss Obama? Yeah, us too. The newly-formed Obama Foundation is a promising sign of future action from the former president. Help shape what Obama calls his “startup for citizenship” by letting the foundation know what issues you’d like them to focus on. 7. Donate to vulnerable causes. Fighting back requires funds. Find an issue you’re passionate about and make donations when you can. The ACLU, which has already filed lawsuits against Trump concerning financial conflicts of interest and the recent immigration ban, is a great place to start. Passionate about protecting immigration? Consider the L.A. Justice Fund, which provides financial support to nonprofit legal services currently participating in immigration court cases and increases the availability of representatives. Disturbed by Donald Trump’s executive order banning refugees? Give to the International Rescue Committee, which provides access to education and direct economic assistance to refugees around the world. Other great organizations include the Environmental Defense Fund, National Center for Transgender Equality, and Planned Parenthood. 8. And donate your time, too. Protests are sporadic, but regular volunteering provides consistent support to those who need it. One of the (many) benefits of living in Los Angeles is the veritable bounty of volunteer organizations. Looking for a good place to start? This survey provides personalized suggestions for actions against police brutality and racism in America. 9. Make sure your congressional representatives are representing you. Calling your representatives is the easiest and best way to make yourself heard. If you’re nervous about cold-calling your congressman, 5 Calls is an app that provides contact information and scripts on a variety of key issues. You can also use Countable—an app that shows upcoming issues in Congress—to give specific feedback on how you’d like your representative to vote that week. Avoid calling politicians from outside your district, as they have no obligation to record your calls. Learn more about the best practices for being an active constituent with the Indivisible Guide, an online resource created by former Congressional staffers. Boycott companies that do business with Trump family businesses or publicly support the administration. The full, frequently updated list ranges from New Balance to NASCAR, and is available here. 11. Get involved with midterm election campaigns. Sign up with Swing Left to locate your closest swing district and find opportunities to support progressives in that district. For most Angelenos, that means focusing efforts on defeating Republican Congressman Steve Knight in 2018, who represents an area that includes parts of northern Los Angeles County. 12. Be prepared to vote in the midterms. Double check your registration status, and remind those around you to do the same. Apps like Turbovote make remembering smaller elections easy, providing registration info and reminders. Non-national elections have notoriously low rates of voter turnout, but many influential laws are enacted on local and state levels. 13. Run for local office. Seriously. Be the change you wish to see in government. Women looking for support have a wealth of resources in She Should Run, a non-profit, non-partisan organization working to close the gender gap in politics and boost representation in government. You can also suggest the organization reach out to a specific woman via their online, anonymous nomination tool. Defend the diversity that makes Los Angeles, well, Los Angeles. This viral illustration shows how to successfully shut down public harassment by focusing on the victim’s safety and diffusing the situation. We are strongest together.